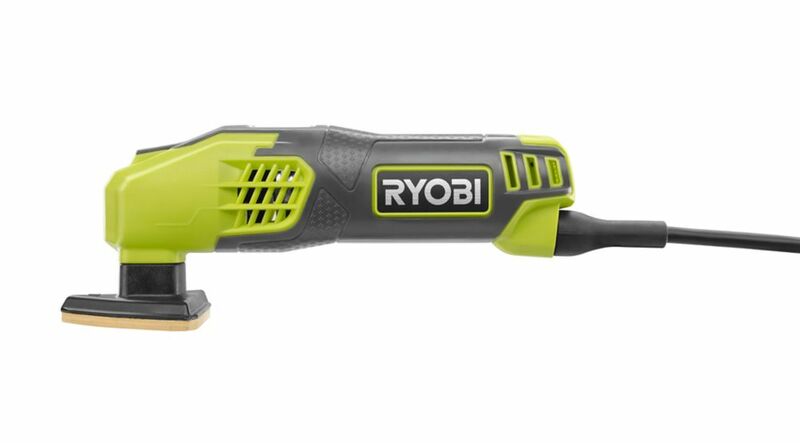 The Ryobi Detail Sander sands, scrapes, buffs, cleans, polishes and removes rust from a wide variety of materials. The sander features a compact, lightweight ergonomic design for comfortable use, and the head's oscillating action enables the sander to easily reach tight spots, nooks and corners. The sander comes with a polishing angle, assorted sanding angles with self-adhesive backs and a stripping pad. The Bosch ROS65VC-5 Random Orbit Sander/Polisher delivers a Vibration Control suspension system, which minimizes the amount of vibration that reaches the hands. This rear-handle sander allows for multiple ergonomic soft-grip positions, enabling comfortable two-handed or one-handed operation for superb comfort. This sander includes a powerful 3.3-amp motor with a variable-speed dial to allow the speed to be matched the task and the material. Its pad-dampening system helps prevent swirl marks, and the microcellular hook-and-loop backing pads that can be used to sand flat surfaces and many contoured surfaces. It accepts Bosch 5-in. and 6-in. high-performance sanding pads. Built with a die-cast aluminum gear housing and a dual-bearing pad mount, this unit includes two dust-collection attachments, a microfilter dust canister with integrated paper filter and a hose adapter for connection to a vacuum cleaner hose. The Bosch ROS20VSC 5 In. Random Orbit Sander/Polisher delivers fast removal and a well-blended, ultra-smooth finish, so woodworkers and finish carpenters can sand quickly and to exacting standards. It is designed to eliminate swirl marks on the workpiece, thanks to an integral pad dampening braking system. Bosch's hook-and-loop disc attachment ensure firm grip of the disc during use. Additionally, the microcellular backing pad is pliable to ensure a smooth, fine finish on both flat and contoured surfaces alike. With a comfortable soft-grip top and body design, this tool has variable-speed control from between 7,500 and 12,000 OPM to match the speed to the task. It also includes an on-board system for filtering fine dust. The Bosch 5-inch Random Orbit Sander produces 12,000 Orbits Per Minute and uses orbital and rotational action and a soft, pliable microcellular backing pad to produce a blended, smooth finish on contoured and flat surfaces. The sander features the Bosch Micro filter on-tool canister system for powerful dust collection and maintains a firm grip on the disc with the Hook-Tight hook-and-loop disc attachment. The Milwaukee 6033-21 1/4 Sheet Palm Sander produces a fine, swirl-free finish. The 3 Amp permanent magnet motor with 14,000 OPM produces dependable speed and power. Button style paper clamp system allows for effortless paper changes. For maximum compatibility the universal hose adaptor allows for connections from all vacuum hose sizes. The plastic dust canister with filter provides efficient dust collection and increased durability. 0.4 Amp Corded 2-7/8 in. Detail Sander The Ryobi Detail Sander sands, scrapes, buffs, cleans, polishes and removes rust from a wide variety of materials. The sander features a compact, lightweight ergonomic design for comfortable use, and the head's oscillating action enables the sander to easily reach tight spots, nooks and corners. The sander comes with a polishing angle, assorted sanding angles with self-adhesive backs and a stripping pad. 0.4 Amp Corded 2-7/8 in. Detail Sander is rated 3.2 out of 5 by 198. Rated 1 out of 5 by Wolf from Cannot find the correct sanding pads for this sander. All pads found are the 'velcro' type. This ... Cannot find the correct sanding pads for this sander. All pads found are the 'velcro' type. This product uses the 'sticky-backed' kind. I will be returning this sander, and purchasing a different one. Rated 5 out of 5 by TIM from Good for what I am doing, sanding metal framing ,... Good for what I am doing, sanding metal framing , preparing for painting works great. Rated 5 out of 5 by HomeDepotCustomer from This drill saved me !... This drill saved me ! Rated 1 out of 5 by Joe from The tools does not work properly stops working after 20... The tools does not work properly stops working after 20 minutes or so. The glue on the sander pads is poor. Therefore, then sander pads used has to be replaced constantly even though the pad is still in good conditions.I do not recommend this tool. Rated 4 out of 5 by Jay from Did the job of getting to hard to reach places... Did the job of getting to hard to reach places while refinishing a dinette set. Easy to affix sanding pads. Rated 5 out of 5 by SgtPredator from This small handheld power chorded triangular sander was great for... This small handheld power chorded triangular sander was great for smaller detailed areas. Although the sandpaper used, 120 grit, didn’t seem to last long it performed very well.